8th book in A Manor House Mystery series! 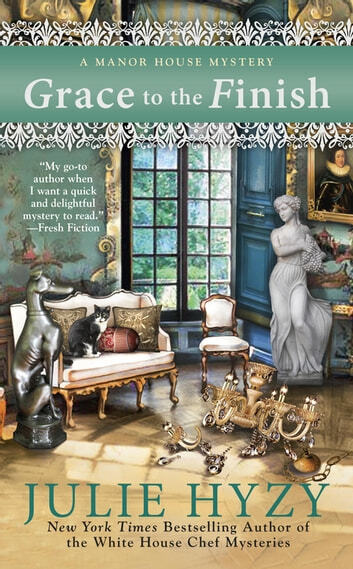 Grace to the Finish by Julie Hyzy is the eighth (and, unfortunately, the last) book in A Manor House Mystery series. Grace Wheaton is touring the Granite Building, the new sight for Amethyst Cellars, with Bruce and Scott. They are preparing to go down to the basement when they see a woman collapsed on the floor at the bottom of the steps. It turns out to be Virginia Frisbie, the banker Scott and Bruce dealt with when buying the building. Upon further inspection of the basement, they discover that someone has been squatting there and items are missing. Did Virginia interrupt a thief which resulted in her death? Grace’s sister, Liza is being released from prison and is coming to live in Emberstowne. Aunt Belinda has agreed to come from Florida to supervise Liza (Grace wishes to avoid her toxic sister). Grace is worried how her sister will behave and what will happen when Liza learns about Grace’s good fortune. It turns out that Aunt Belinda has already informed Liza, and they have hired an attorney. Grace needs to find a way to stop Liza. An old memory sends Grace searching through old family photo albums. Grace sets out to unearth what was happening at the Granite Building in the hopes of catching Virginia’s killer. She will need to multitask to keep up with her work at Marshfield Manor, snare a murderer, uncover a way to hinder her conniving sister, and, if Grace is lucky, find time for a date with Dr. Joe Bradley. Grace to the Finish is well-written, has good characters, and a nice setting. It has been interesting to watch Grace (as well as the other characters) develop over the course of the series. She is slowly adjusting to her new role as heir to Bennett Marshfield. I like that Grace is an intelligent and articulate main character with a good moral compass (as well as relatable). I wish there were more main characters like Grace in cozy mysteries. The pace of the story is medium. There is quite a bit of activity in the story and numerous details that go along with it (which slows down the flow of reading). Two of my favorite characters are Frances and Flynn. They provide humor to the story (it helps to lighten it up). Grace to the Finish is best read after finishing the first seven books in the series. Each book in the series builds upon the previous one. I give Grace to the Finish 4.50 out of 5 stars. I just wish the two mysteries had been more complex (I would settle for one). The murder mystery and the one regarding Liza were easy to unravel. Actually, the murder of Virginia Frisbee is a storyline that unfolds instead of a mystery that readers can solve (I prefer a mystery that I can solve—I find it more captivating). I appreciated that Grace works with the police to solve the crime (instead of going behind their backs or working against them). The romance was not over-the-top in the story (thank goodness). It was light and enhanced the story. I am saddened that there will be no further books in A Manor House Mystery series. We need more cozy mysteries like Grace to the Finish.